Coat inside of casserole with cooking spray. Fill a large sauce pan with 6 cups of water. Add 2 teaspoons salt, 1 teaspoon garlic powder, and 1/2 teaspoon black pepper. Add chicken breasts. Cover, reduce heat to medium and cook 15 minutes. Remove chicken breasts from water and set aside. In a bowl, combine rice, chicken broth, mixed vegetables, garlic powder, minced onion, and cream soup. 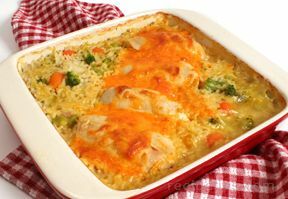 Pour mixture into prepared casserole, top with chicken breasts, and sprinkle with cheddar cheese. Remove cover and bake an additional 25 minutes, or until liquids are absorbed and rice is tender.